The first 2x super telephoto Nikkor lens to be fitted with both Vibration Reduction (VR) and Silent Wave Motor (SWM). The AF-S VR Zoom-Nikkor 200-400mm f/4G IF-ED features a super telephoto zoom reach with the advantages of Vibration Reduction for increased photographic opportunities in low light. The Vibration Reduction system offers up to three stops slower shutter speeds either in Normal Mode for hand held shooting or Active Mode when shooting from a moving platform. The VR system can also detect panning movement. The optical design includes 24 glass elements in 17 groups manufactured to the latest environmental standards. Four ED glass elements ensure sharp, high contrast results with film or digital. The picture angle is equivalent to 135 format focal lengths of 300mm to 600mm when used with a Nikon DX format Digital SLR, fast and quiet auto focus enabled by the incorporation of a Silent Wave Motor (SWM). The f/4 maximum aperture and overall length remain constant at all focal lengths and focus distances, and a new 'Memory Set' button close to the camera body, facilitates instant one touch focus re-set. Environmental protection has been attended to with rubber seals around the F mount bayonet and drop-in filter slot, and damage prevention has been improved thanks to a removable clear glass front element. 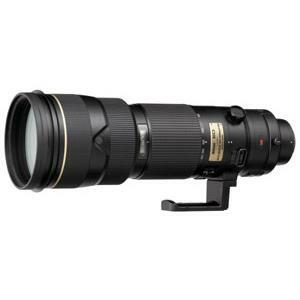 Weighing in at just 3200g, the lens is about 300g lighter than the AF-S Nikkor 500mm f/4D IF-ED II.